Adenosine Monophosphate activated Protein Kinase (AMPK) regulates cell metabolism i.e “AMPK has a central regulatory role in cell metabolism, mitochondrial biogenesis and oxidative stress response”. 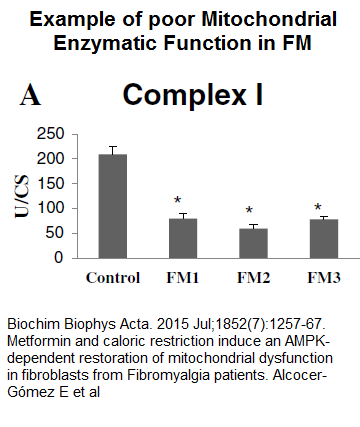 Recent study of FM fibroblasts found AMPK downregulated.”AMPK down-regulation [is] at least in part responsible for the impaired oxidative stress response and mitochondrial dysfunction observed in Fibromyalgia”. 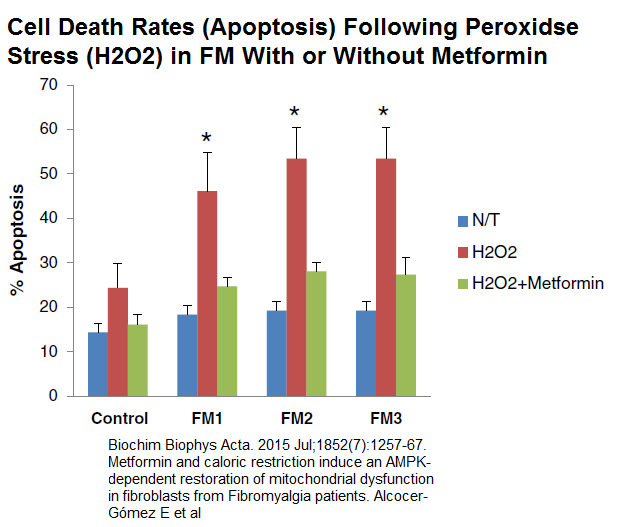 AMPK activation can be obtained by metformin. Also perhaps by weight loss as serum from weight loss restricted mice activates it. Implications are that weight loss and metformin can set one’s metabolism some straight. FM subjects are susceptible to oxidative stress potentially leading to cell deaths and above measures help contain that as well. Biochim Biophys Acta. Molecular Basis of Disease. 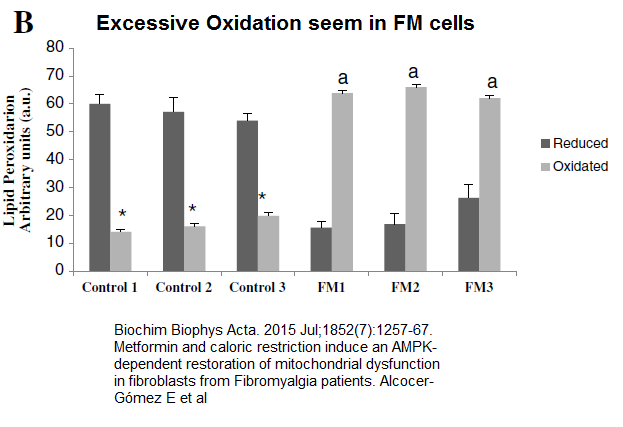 2015 Jul;1852(7):1257-67.
mitochondrial dysfunction in fibroblasts from Fibromyalgia patients. Wilke, William S., Carmen E. Gota, and David J. Muzina. Fibromyalgia and bipolar disorder: a potential problem?. Bipolar disorders 12.5 (2010): 514-520. This heightens need to treat any depression seriously but also consider FM a metabolic disease. Metformin is an interesting agent as it is shown to help prevent and slow down certain cancers and would not be bad to take. FM is becoming more legit! This entry was posted in Depression, Drugs, Fibromyalgia. Bookmark the permalink.